Yesterday I attended the Researching and Using Japanese Collections in Museums study day at the Palace Green Library, University of Durham. The Library is currently host to the V&A exhibition The Seven Treasures: Japanese Enamels from the V&A and their own in-house production Off the Wall: The Art of the Japanese Movie Poster, both well worth a visit (http://bit.ly/SKf9WH). The day was filled with fascinating papers from both UK and Japanese colleagues that addressed the wide and varied nature of Japanese collections in the UK. Such collections which can be found in museums, galleries, libraries and stately homes are testament to the UK’s relationship with Japan politically, economically and industrially over the past several centuries. I was intrigued to hear about historic and contemporary industrial connections between England’s north-east and Japan, as presented by Andrew MacLean, National Trust. 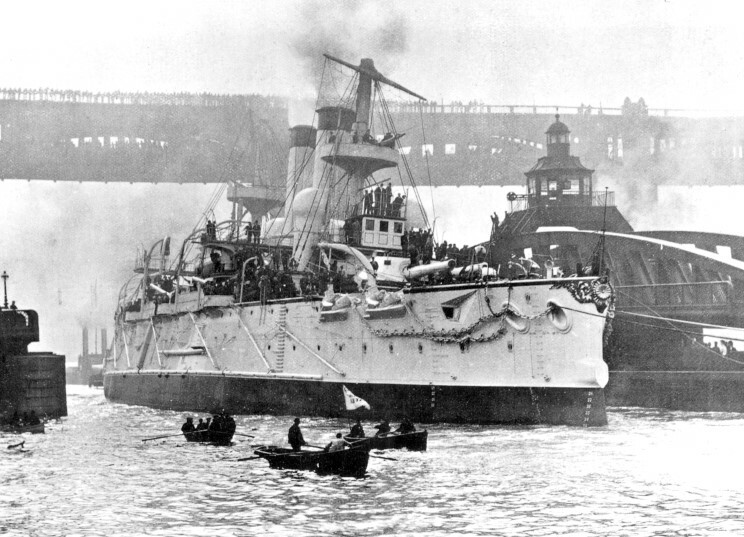 Battleship Yashima on the River Tyne after fit out in 1896. It was built for the Imperial Japanese Navy by Sir W G Armstrong Whitworth & Co Ltd.
Dr. Yoshi Miki, Curatorial Consultant and Visiting Professor, detailed his experience of compiling the recently published Survey and Analysis of the Database of Japanese Collections in the UK and Ireland, in which Manchester Museum’s internationally important Japanese collection is included. This comprehensive publication, as funded by the Inter-University Research Institute Corporation National Institutes for the Humanities, scrutinises access to UK Japanese collections on-line. This publication is a must for anyone interested in Japanese collections and access to museum databases on-line. It was exciting to hear further news about Manchester Art Gallery’s forthcoming East Asian exhibition by Janet Boston, Curator: Collections Access at Manchester City Galleries. Development of the exhibition has led to a fundamental reappraisal of Manchester Art Gallery’s Japanese collection and stimulated contemporary collecting. We’ll be loaning several pieces from our Japanese collection to support the exhibition. There are almost 2000 Japanese objects in the Living Cultures collection. They range from large pieces of furniture to intricately carved netsuke. The majority of the collection belongs to the 1958 Robert Wylie Lloyd bequest, an industrialist who also bequeathed his butterfly collection. Interestingly the Japanese collection bequest was split between us and the British Museum. Damian Scully, Objects in Mind Project Lead, recently shot a short film of one of the objects included in the Lloyd bequest which you can see below. All this talk of Japan stimulated me to read again a captivating article called A Samurai at Oxford published in the Manchester Evening News 2nd December 1982. The article details the exploits of Mr Nori Shibahara described as a ‘sort of unpaid Japanese consul’ , a gift shop owner on Brazenose Street, whose ancestor Saburo Ozaki arrived in the UK in 1867 dressed in full samurai attire. Shibahara arrived in Manchester in 1966 when the article claims there were only two other Japanese people ‘a judo instructor and a nurse’. Shibahara was conscious of the lack of understanding about Japan and it’s people, culture and history when he first arrived. He stated that ‘I’ve been to bookshops in Manchester to find books on Japan and when I’ve opened them, they’ve shown hairstyles 100 years out of date’. As chairman of the North West Japanese Society Shibahara promoted greater understanding of Japan across the region. In this vein, with our ever popular Japanese display in the Living Cultures gallery, we’re continuing to promote further understanding and interest in Japan across Manchester.